Sebile's Pivot Frog is a soft body designed to collapse for maximum hook penetration. Using the Gravity Hook System, a pivoting single wide gap hook, allows the hook to freely rotate position. This allows for fewer snags and increases hook up and landing ratios. Two hook systems are difficult to hook bass while the Pilvot Frog focuses all the force applied by the angler on one hook point! Fish it in open water and the slop working the bait between pads while pausing intermittently. Equipped with round bend wide gap weighted black nickel hook. This frog is a 2-1/2" Floating Topwater 1/2oz. 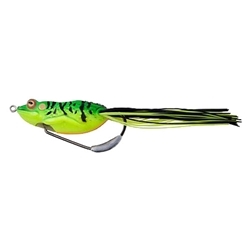 It has a keel weight affixed to hook makes the Pivot Frog have the lowest center of gravity on the market and causes the Frog to be more stable and consistent when fished.